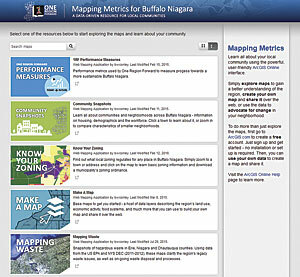 The University at Buffalo Regional Institute used an ArcGIS Online Public Gallery app to create Mapping Metrics for Buffalo Niagara. The University at Buffalo Regional Institute (UBRI) in western New York and the City of Greater Sudbury in Ontario, Canada, are using ArcGIS Online to improve communication with citizens and provide them with data and tools to make better decisions for their neighborhoods. Both organizations are empowering citizens to explore authoritative data about their neighborhoods, create maps and applications based on that data, analyze the results contained in these information products, share their insights with local officials, and ultimately make better decisions about their neighborhoods. While UBRI has been accomplishing this using a public gallery app it created and hosts on ArcGIS Online, the City of Greater Sudbury has been achieving this by leveraging its ArcGIS Open Data site and the city's ArcGIS Online site. UBRI is a public policy, urban planning, and design center for the University at Buffalo School of Architecture and Planning. A year ago, UBRI realized that while it had lots of data on the Buffalo Niagara region that residents would find valuable, it was not sure what to do with it. The team had been collecting and analyzing geographic data as part of a three-year regional planning and community engagement project called One Region Forward. The project was supported by the Partnership for Sustainable Communities program created by the US Department of Housing and Urban Development (HUD). Although much of this was public data, few residents knew of its existence, where to get it, or how to use it to improve their lives. In addition, this data was not available at a regional scale. The One Region Forward team created mapping metrics for Buffalo Niagara using the Public Gallery app that comes with ArcGIS Online. The One Region Forward app makes all the data and maps about Buffalo Niagara that the team created over three years accessible from one easy-to-use interface. 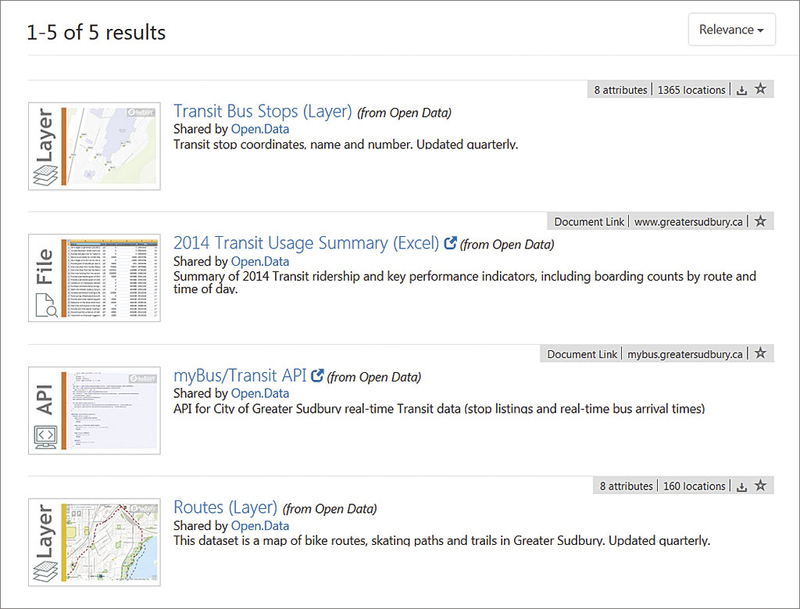 The City of Greater Sudbury Open Data Portal site makes a variety of data on transportation and other topics available. The gallery also features intuitive tools and applications. Using regional data available from the gallery, residents can make maps related to topics such as land use, economic activity, and food systems and share these web maps with local officials. They can also find out the local zoning regulations, hazardous waste locations, and how individual parcels in the region perform on key place-based measures of sustainability. The gallery's Community Snapshots summarizes data relating to housing, demographics, and the workforce for any neighborhood in Buffalo Niagara. The One Region Forward project team integrated the gallery into Citizen Planning School, its civic engagement program. The One Region Forward team held workshops with program participants to show them how to access the gallery tools, use these tools to create maps on sustainability topics, and share maps to gain support for projects to increase the region's sustainability. Once the One Region Forward team had gathered and analyzed all the regional data as part of the project, it took only about two months to organize the data, set up the server, and configure the site and mapping applications. Training Citizen Planning School participants was not resource-intensive because the tools are intuitive. Using ArcGIS Online saved time and money. Multiple analysts with ArcGIS experience could simultaneously work on configuring mapping services and web applications without spending time learning an API or new software. By using ArcGIS Online, the One Region Forward team didn't need to code anything, so it avoided the expense of hiring a web developer and could use this money for other components of the project, such as the Citizen Planning School workshops. Although the One Region Forward team would have liked to tailor the look and feel of applications a bit more, the benefits of using ArcGIS Online outweighed this limitation. More important, the One Region Forward public gallery has enabled active community members, who keenly understand their neighborhoods' challenges and opportunities, to use meaningful maps and data to gain support for citizen-led sustainability. Brian Conley, GIS research analyst for UBRI said, "While there are other public data tools that Buffalo Niagara residents can use to do this, having one accessible interface that combines all the data related to the numerous issues that affect the Buffalo Niagara region—with experts on hand to offer instruction and guidance on how to best communicate results—provides citizens with a much richer and more useful experience." 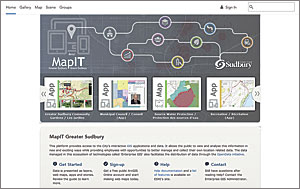 The MapIT Greater Sudbury site allows residents to access and explore the city's GIS applications and data. In 2015, the City of Greater Sudbury Information Technology (IT) Division found itself in a similar situation. It wanted to share its authoritative data with citizens so they could create impactful maps and applications. Although the IT Division had successfully administered its ArcGIS Online site for several years, the site was used primarily for employees and offered the public only a few datasets. The city's location platform had not been fully realized as a tool for sharing information and engaging with the public. That April, Greater Sudbury city council unanimously approved the creation of an open data site as part of its Open Government initiative. The Sudbury Open Data Portal was launched just three months later. It contains datasets related to the environment, community, government, transportation, and other categories. Each category contains map layers, RSS feeds, APIs, and other items that were all easy to make available to the open data site through ArcGIS Online. After just six months in operation, the open data site receives hundreds of visits each month. The data it makes available has resulted in the creation of several free apps by local developers. Open datasets hosted on ArcGIS Online for Organizations are also being used by the city to create the Childcare Locations in Greater Sudbury map, the Your Municipal Council app, and other maps and apps. The open data site was easy to set up. Renée Higgins, the city's open data lead, said the city spent three months educating staff, reviewing dataset suggestions, following the city's publishing process, and preparing data for public use. Creating and customizing the open data site itself took only three days. The open data site has resulted in considerable cost savings and efficiency gains for the city. Higgins explained, "We evaluated other popular open data solutions and determined that costs could range from $10,000–$20,000 annually for hosted open data sites." Because the City of Greater Sudbury has an Esri Enterprise License Agreement, it could establish its ArcGIS Online and open data sites at no additional cost. 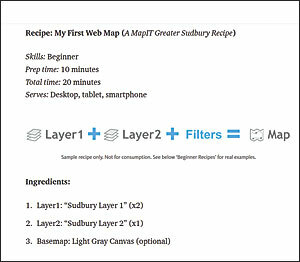 Recipes, an innovative idea implemented by the City of Greater Sudbury's Information Technology Division, helps users get started with MapIT Greater Sudbury. With the success of the open data site and its seamless connection to MapIT Greater Sudbury, Greater Sudbury's main ArcGIS Online site, residents began making greater use of the city's site. Previously it had served a handful of city employees and a few applications. Paul Giroux, GIS analyst/administrator for the city said, "We understand that the connection between the open data site and our location platform provides us with an opportunity to raise civic proficiency about modern mapping (web GIS), and through engagement, we can begin fostering a set of public geo-innovators." 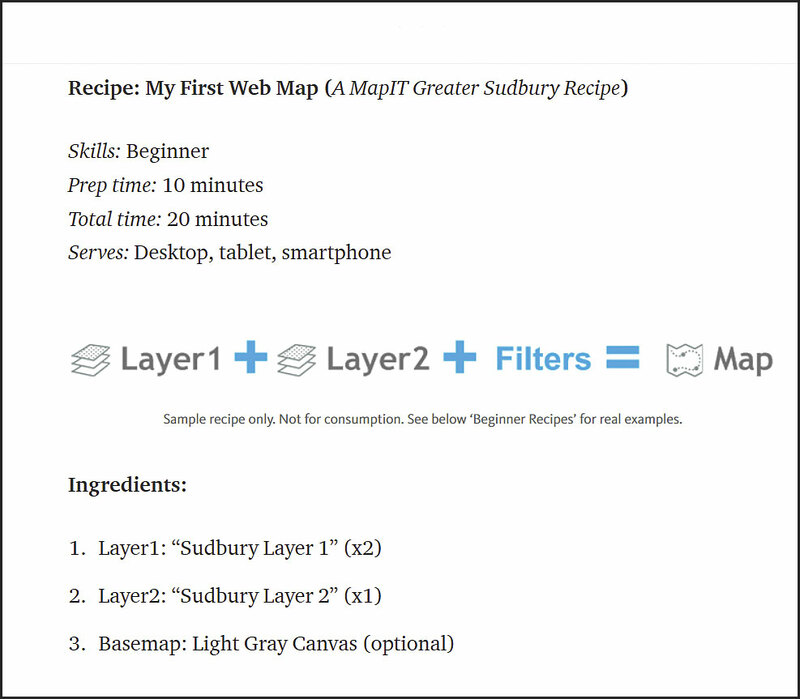 Now, Sudbury residents as well as city employees can create and share layers, web maps, data, interactive stories, and applications on MapIT Greater Sudbury. Some information products are then shared to the open data site. Like One Region Forward, Greater Sudbury's IT Division is teaching citizens how to use both Sudbury Open Data Portal and MapIT Greater Sudbury. Giroux explained, "Having quality open data and products on the platform is one thing, but what good are these if people don't know how to use them?" One way the IT department has been building civic proficiency is by creating recipes that explain how to get started with MapIT. Giroux also plans to use these recipes as the basis for lessons at local elementary schools and universities and as part of employee and public MapIT User Group meetings. As a result of these sites, residents and employees can easily and efficiently view, analyze, and share quality public data on a variety of devices. They can also better collect, store, find, and manage their own spatial data. This has resulted in significant time and cost savings for the city and continues to introduce greater efficiency as more users become empowered with Esri's location platform. More generally, the public sites have fostered an increase in geoawareness among constituents, employees, and students. They have learned how to use the ArcGIS platform and harness this knowledge to improve their neighborhoods. Unlike GIS professionals in many organizations, those working on the One Region Forward project and at the City of Greater Sudbury did not stop after they created great data and applications. They put data and apps into the hands of residents and showed them how to use the data to improve local communities. In doing so, these organizations increased citizen participation, government transparency, and data-driven decision making in their neighborhoods. Both organizations used ArcGIS Online to accomplish this, but in slightly different ways—UBRI by leveraging the Public Gallery app and the City of Greater Sudbury by enabling the open data capability available through ArcGIS Online. 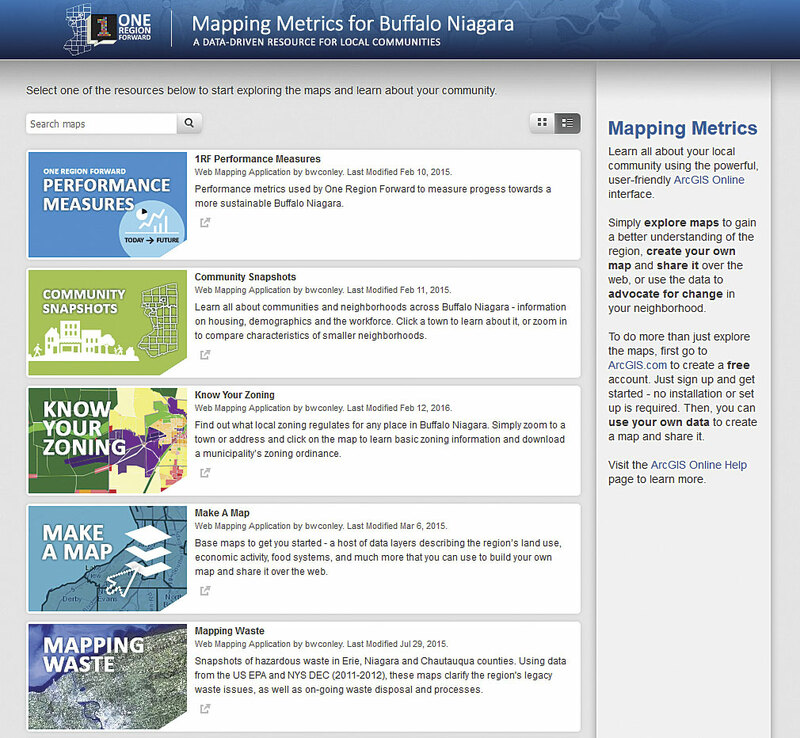 For more information about Mapping Metrics for Buffalo Niagara, contact Bart Roberts, Associate Director of Research and Faculty Engagement, or Brian Conley, GIS research analyst. To learn more about MapIT Greater Sudbury, contact Paul Giroux, GIS analyst/administrator. For questions about the city's open data site, contact Renée Higgins, open data lead for the City of Greater Sudbury. To learn more about how to make your data, maps, and applications more accessible to your community and foster civic engagement, visit ArcGIS Online and ArcGIS Open Data.